Is there no end to the benefits of knitting? Knitting will help you sleep, and here’s some proof that might make you crack a smile (and break out the needles). Knitting helps you sleep? You betcha! We’ve posted before on the health benefits of knitting, and how knitting can help people deal with mental health problems. The reason that knitting helps in these ways is that it is meditative in nature, requiring focus and repetetive hand movements that clear the mind. If you’re stressed and overwhelmed, you probably won’t be sleeping – take 20 minutes out of your bedtime routine to knit a few rows and get ready for good dreams. Though no scientific studies have been done (that we’re aware of), it’s a pretty sure thing that you’ll sleep better under blankets that you knit yourself, on pillows with super soft covers that match your bedroom. There’s something calming and relaxing about climbing into bed with something you made yourself, and knitters know that most of all. Studies have shown that laying in bed while you can’t sleep can make insomnia worse and lead to chronic sleeplessness. Scientists suggest that tossing and turning for more than 20 minutes can disrupt your sleep cycle! Instead of getting frustrated and performing sleep math (for example: “If I fall asleep in 10 minutes I can still get 5 hours of sleep!”), get up and knit a few rows to clear your head. For an added bonus, listen to a white noise app while you do it. Caution: don’t knit complicated things while tired! Your sleep-knitting should be plain garter or stocking stitch. Learn from our mistakes! If knitting helps you sleep better, tell us in the comments! 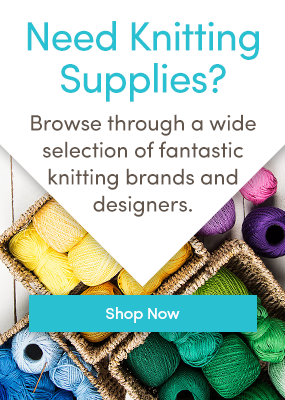 Love knitting inspiration and information? Follow us on Bloglovin’ and never miss a post. I knit no matter how tired I am (I feel guilty if I’m not doing something while just sitting)!! Friday night I was exhausted but picked up my current lace shawl project and just knitted away. Saturday morning I sat down to start and looked back at the lace pattern. What? How? Who? I had managed to mess up several rows but the number os sts had come out correctly. How did I do that??? So I had to frog back. That is very good advice to not knit complicated patterns while tired…now you tell me. Knitting helps me do everything better. I picked up knitting again last year after not doing much of it for years. It was an extremely stressful time and it’s continued to be. When I started knitting again last year I didn’t know about all of the studies that prove it helps manage stress. I’m proof positive it does. Not only is it meditative, but when I’m doing something else that I don’t like, knowing that I’ll have a few minutes for knitting later in the day gives me something to look forward to. I love having 2 projects on the go – an easy one (like the leg of a pair of socks) and something that requires focused concentration (lace or colour work). I can pick up the project that suits my mood. I love to knit a bit before falling asleep, even if it’s a row or 2 on a dishcloth. I took up knitting after a major operation and I have felt the benefit tremendously in all sorts of ways – it started as a way to forget the pain I was in and to help with my breathing – whilst I was knitting I wasn’t worrying about trying to catch my breath, it just happened naturally. This obviously led in turn to it helping me relax and de-stress! It does help me sleep – if only because I tend to knit until I’m very tired and have to sleep! I think I may be a bit obsessed! I once fell asleep while knitting a ten stitch blanket. It was just a plain garter stitch and I was on a long edge. My husband and his son were talking and we were all sitting on the couch. I had my feet up and was very relaxed. I fell asleep mid-stitch. When I think I can’t manage to fullfill all the tasks and jobs I have to do, I start knitting. Knitting is somehing I can master so that I feel competent enough for the rest of my life. In my therapy I’ve found out that I automatically choose projects that fit to my emotional needs. I work for a national retailer. Knitting helps me de-stress from a long day of abusive customers. I get something of use in the end if I don’t give it as a gift. I’ve even nodded off while mid row. Knitting relaxes me and helps me sort out any stressing thoughts I might have. However, I am most relieved to see by the other comments that I am not alone in this addiction. I have been knitting daily for about 3 years now so I have lots of boxes of completed items. I love to just pick a pattern and knit it. Hence I have a variety of items in all arranges of colours. I have just ordered a pack to crochet a blanket with “coastal” colours. Maybe I should just complete the rows during daylight or I will be nodding off with the colour hues!!! My family just wonder come Christmas or birthdays what their parcel contains and is it a knitting item ! ha! My grandson never complains though as his favourite is a knitted badger he takes to bed every night. I get so awfully nervous when my spouse drives the car. I don’t know why, he is a good driver. I can’t help making comments, and he hates it. So I have to knit in the car, and it has to be something that I have to keep my eyes on all the time. Now there is peace in the little family. When I can’t sleep, I try to imagine, what my hands do when I knit. I try to see it before my eyes. It often works. Oh!! I am glad to read that I am not the only one to do that! Absolutely! Knitting a bit before bedtime does help me to sleep better, more fitfully. Some days, I’ll knit a row or two before I start out for the day, which helps me to have a calmer, less chaotic day. In fact, I have fallen asleep in my comfy chair, with the TV on, and the knitting in my lap on many evenings. Here’s an amusing story – I had to report to a court hearing as an eyewitness to an incident, and I took my knitting project with me in case there was a long wait for the hearing to be called. A Policeman who had just finished the night shift took a seat next to me and watched me do simple stitches. While watching the knitting, he fell into a very quiet sleep! I had no idea he was sleeping, as the court had to call his name several times, he was that peaceful! As he got up to talk with the court administrators, he remarked to me, “Ma’am, that was the best sleep I’ve had in a very long time, thanks to you sitting with your knitting. Just by watching, I became quite comfortable. Thank you, Ma’am.” I was astonished! Although I too knit every night, I do not sleep well. But I think I will start keeping a small project next to the bed, and then those nights when I’m awake, I’ll try knitting for a while instead of reading or tossing and turning. I’m a definite yarn and crochet addict. My day doesn’t feel complete if I haven’t crocheted. I too find it a perfect way to keep the blues away and soothe a racing mind. The research must be true as I am another who can drop off to sleep mid row. I thought there was something wrong with me, so I’m quite relieved to read that I’m not the only one! I love the story about the sleeping policeman! I work a phone job for a very good company and even though we are very busy they allow us to knit. During stressful calls I knit while I am having to listen to people complain, it helps with the stress. I knit before bed and if I am having trouble sleeping I imagine knitting the stitches to help fall asleep. I have a bad panic disorder and knit and crochet for a charity which keeps my mind on someone else besides me. I feel the need to knit every day also. I love watching a project progress. Having something tangent to touch is a great feeling. I have taught many a student to knit. I watched students complete their work and then take out their knitting. 🙂 I found websites that showed that I could use knitting in basically all the subjects. We discussed how knitting relaxed people under stress. So, during testing time, I would bring in my knitting in a bag I wore over my wrist and knitted. The students said it really helped to look up and see me walking the room knitting. I am retired now, although it is way to early, but I take my knitting with me everywhere. I take my mom to doctor’s appointments and I have had many nice conversations. When we went to California two weeks ago, I had knitting. It is ok to have more than one work in progress (WIP)! For easy knitting, get some kitchen cotton (for example, Lily’s Peaches & Cream), simple cast on 48 stitches, and knit in garter stitch until you have one wingspan of yarn left, then bind off. You will have a dish cloth people will actually use, and you do not have to worry about loosing your spot in the pattern. It is perfect for insomnia, doctor/hospital visits, at sporting events, or riding in the car.